ICICI Bank is a premier Bank in India. ICICI Bank had started a very good service to their customers for recharging any prepaid mobile by sending a simple SMS from their registered Mobile Number. 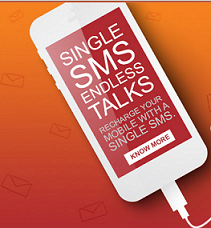 Customers can recharge their prepaid mobile by sending below SMS to the number 9222208888. For example - If you want to recharge your Vodafone mobile number 1234567890 with amount 100 rupees then you need to send the below SMS to the number 9222208888. Here last 123456 is last 6-digit of your ICICI Bank Account Number. For example - If you want to recharge your Airtel Broadband number 1234567890 with amount 100 rupees then you need to send the below SMS to the number 9222208888. Here last 123456 is last 6-digit of your ICICI Bank Account Number. For example - If you want to recharge your Tata Sky DTH 1005825110 with amount 100 rupees then you need to send the below SMS to the number 9222208888. Here last 123456 is last 6-digit of your ICICI Bank Account Number.